Open and airy conifer (cone bearing) with light green foliage turning darker with age. One of the best known trees from the South Pacific. Will tolerate warm temperatures and does not even object to dryness, although it does not like glaring sunshine. 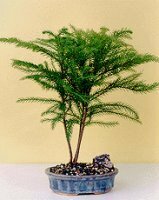 We grow them in groups of three (3) in a pot and trim the branches by hand (thumb and index finger.) Decorates well for any holiday or season. Easy care. Group of three trees, each 4 years old, 8" tall. Recommended indoor bonsai tree. Decorates well for holiday season.